You know those moments where you just dream. Maybe it's dreaming about leaving your corporate job, your next big vacation, what you'd do with a million dollars, or how you'd design your dream house if you ever had the opportunity to build. I thought about the latter a lot. I had a Pinterest board dedicated to my dream house. I was obsessed with Interior Design and Fixer Upper. In a way, I think continuing to think and talk about my dreams, putting them out their in the Universe, almost assists in helping them come true. That's just my optimistic self having a little faith in life's plan, but I feel there's so much truth to it. When you start speaking about your goals and dreams, writing them down, creating those dream boards, I think it puts the Universe in motion. It puts karma on your side. 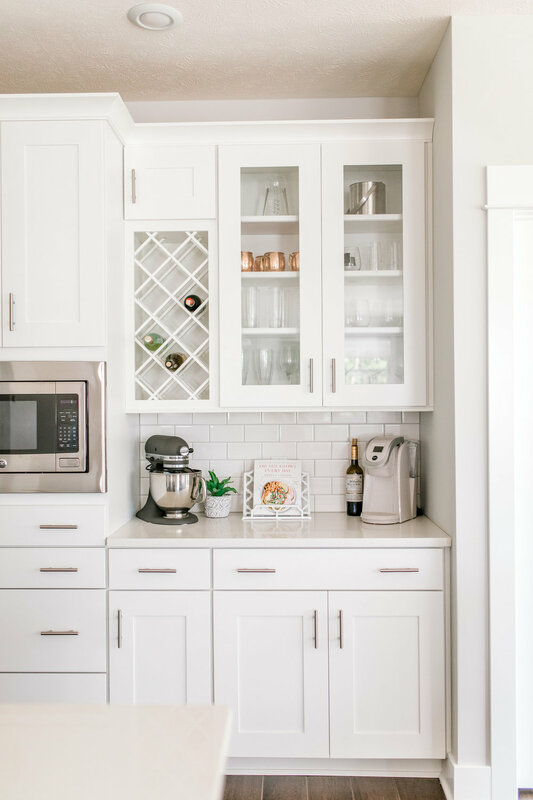 My Pinterest board was filled with tons of beautiful photos of what that home may look like if I ever had the luxury of building, but what I mostly noticed was that I was pinning images of kitchens. White kitchens. 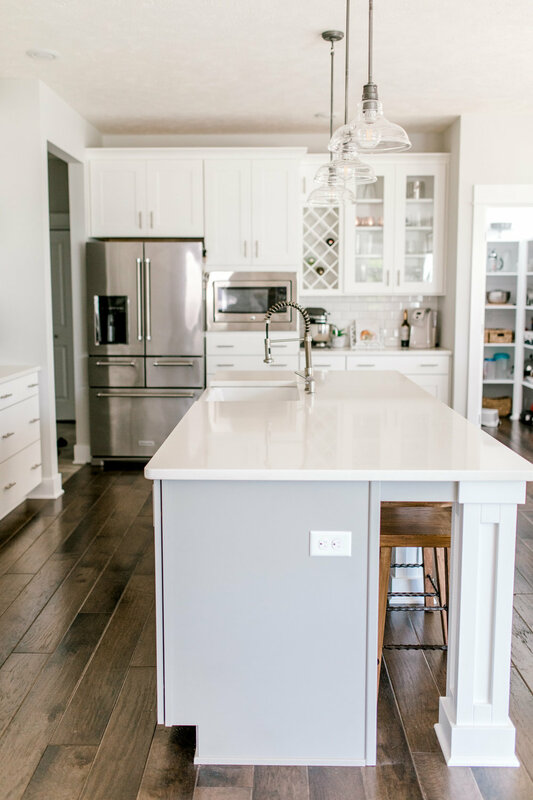 White modern farmhouse kitchens more specifically. And when Fixer Upper settled it's perfect little self onto my TV screen weekly, I fell in love with that style even harder. Building had been a dream of ours. One I wasn't sure would ever come to fruition, but it was on our radar and talked about from time to time. When it was first discussed, we had just moved into a newer neighborhood, almost doubled our previous mortgage, and I had recently left my full time salary position to pursue photography and entrepreneurship. We were hardly in a position to even consider such a thought any time soon, AND the house we moved to was beautiful - only 8 months old! Maybe it didn't totally embody our personal style, but it was fitting for our current situation, and I definitely felt blessed. But then my business grew fast. Faster than I anticipated. In 3 years I was working less and making more than at my full time 8-5. I had the freedom to make my own schedule and stay home with my boys. It couldn't have worked out any better. We also kept our eye on the housing industry. I had a rental home we recently sold, and knew it was a seller's market. On a whim one Saturday afternoon in April 2017, we walked through the model home in our neighborhood. Just for fun really. No strings attached. Well things escalated quickly from there. Our wheels started spinning. I pictured how everything would look if I were to put my personal style on it. For the next 2 weeks, the idea of building consumed me. Dan and I discussed the financial aspect of it. We knew that if we were going to do this, it would need to be worth it. We spoke with a bank to see what type of loan we could get approved for. We had an appointment set up with the sales manager in our neighborhood and started driving around to the available lots. Things were in motion. I'll spare all the nitty gritty details, but two weeks after we walked through that model home, we had put a down payment on a lot. There were tears. WE WERE BUILDING A HOME. I'm pretty sure all aspects of my life were ignored because all I could think about was this home. Sorry husband and kids. Hah! We were building from the ground up - a home that I would get to design. Everything from flooring, to countertops, door style, light fixtures, knobs and handles. There was so much to think about. I was giddy with excitement but at the same time completely overwhelmed. I felt totally selfish for feeling such stress over something that was such a huge blessing to us - but man that anxiety was real! We built with Eastbrook Homes and opted for their Newport floor plan because of the layout of their upgraded kitchen option. Dan and I each had our "things". Those things that were important to us in this build. His primary was flooring, mine were kitchen selections. Dan knew the kitchen design was important to me, so let me run with 95% of that! 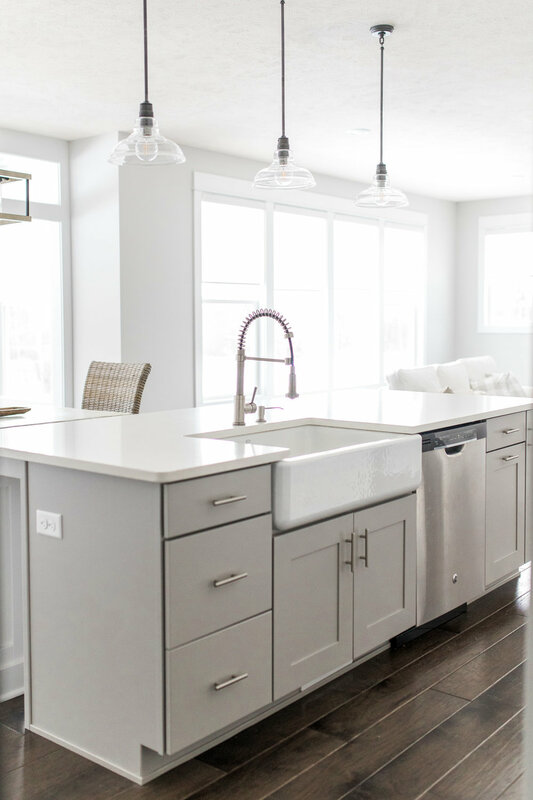 My vision was a light & airy modern farmhouse kitchen with industrial elements. I wanted it to feel bright, open, and inviting - but have a timeless feel. If we were to sell 20 years from now, I wanted the design and selections to stand the test of time, and still be relevant to buyers. For this reason, we used neutral colors and classic materials. 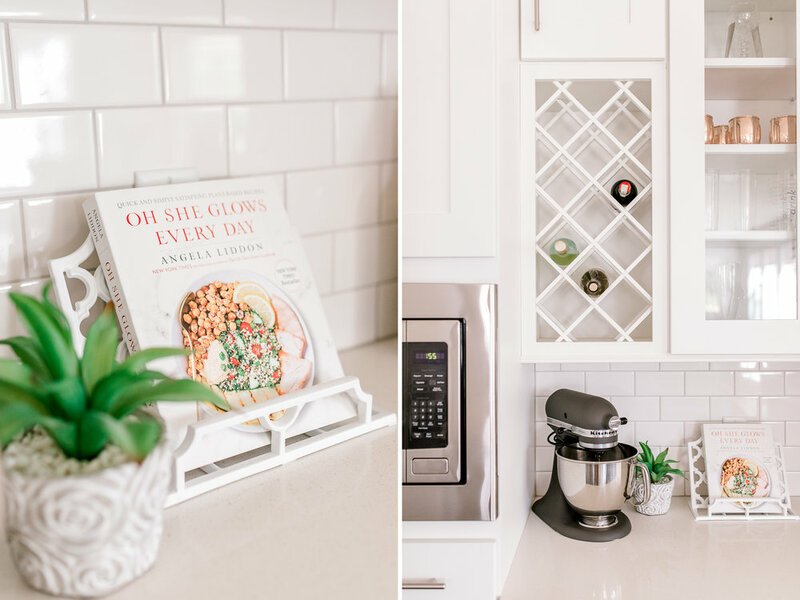 White & gray is a theme throughout our entire home, and I am SO happy with that decision. With Eastbrook Homes as our builder, we were assigned an interior designer to work with at their Home Creation Studio. This is where we would make the selections to complete our style and vision. Including, but not limited to, countertops, carpet, tile, knobs, and exterior color...alllllll the things are chosen here. 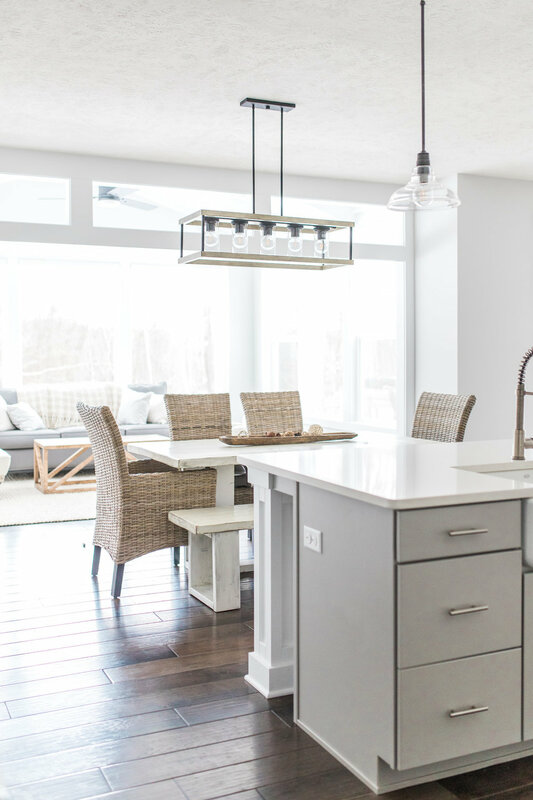 We did opt to look outside of Eastbrook for a few light fixtures we had a specific vision for, other than that, the Home Creation Studio was our best friend. After two days and six hours with our designer, our selections were complete. Aside from ground break and closing day, these were the most exciting hours of the process! I went with a creamy white shaker style cabinet for the surrounding uppers and lowers with a matching wood hood vent, and a light gray island base to contrast. I wanted to be able to showcase some of our prettier dishes, so selected to have 4 uppers with glass doors. Two are adjacent the hood vent, and the other two above our bar area to showcase our stemware. Speaking of the island, that was a huge draw for us as we love to entertain. It's 9ft long and we extended it length wise to 4ft so we had plenty of room for guests and our kiddos to sit and eat at. Our bar stools were a bit of a splurge, but when I spotted them, I knew they were the ones. They perfectly compliment that farmhouse/industrial feel we were aiming for. 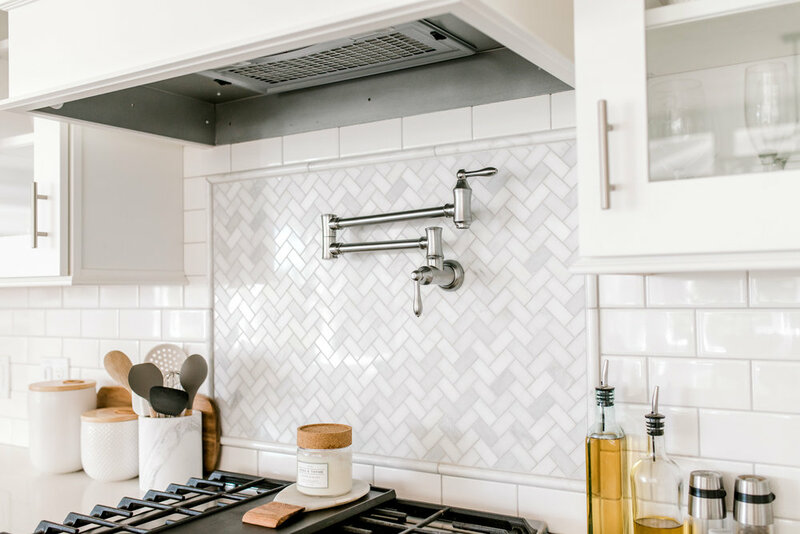 Our countertops are a paloma white quartz, and I choose a classic white subway tile with a light gray grout for our black splash. A very last minute addition was the pot filler and marble herringbone picture frame backsplash just below the hood vent. 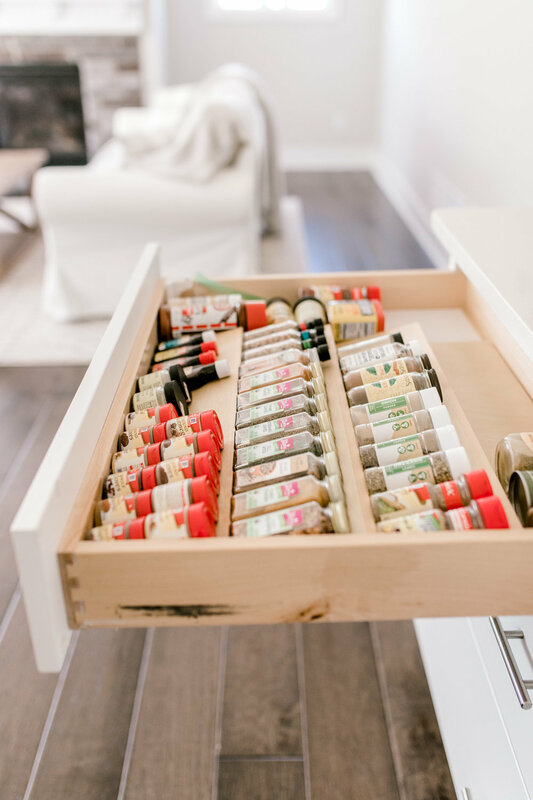 This may be my favorite element of the kitchen, but really it's near impossible to choose. 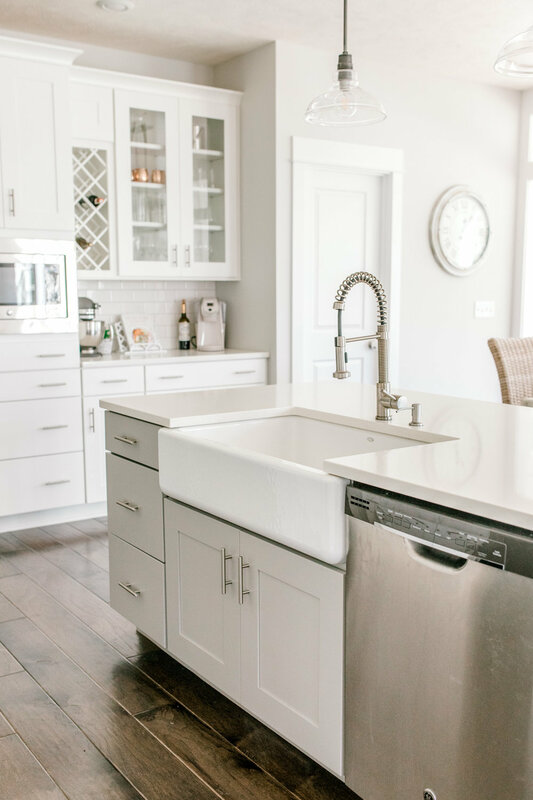 A large open basin farmhouse sink was high on mywish list, so I was elated to find out that Eastbrook Homes had a beautiful white Kohler selection. DONE! We found our 3 island pendants on sale from Restoration Hardware, and I'm in LOVE with their classic industrial feel! 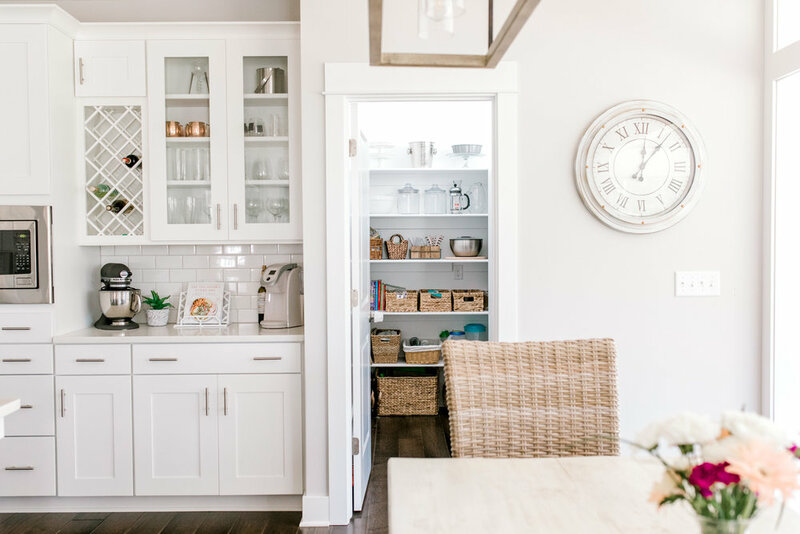 Our dining room chandelier is actually an outdoor fixture from Houzz, but we fell in love and decided it was the perfect choice for our above our farmhouse table. Speaking of, that table was custom made by Haven Creek. They are the cutest little home decor shop with all the Magnolia feels, right here in my little Rockford town! They make beautiful custom, hand crafted furniture that fits perfectly into any style of home. Dan selected the flooring, and went with a dark walnut engineered hardwood. We decided to extend this flooring through most of our main floor covering our kitchen, walk-in pantry, dining, living, and Michigan rooms. Initially I wanted to go with a gray toned floor, but I am SO happy with how beautiful and classic this floor looks. And it contrasts our light & airy kitchen just perfectly! And the pantry. Ohhhh the pantry. This build nearly tripled the size of our previous pantry, and our previous one wasn't even all that small! It's a walk-in L shaped pantry that we upgraded to have all wood shelving, and added a transom window. If we had the budget, I would have added probably a half dozen more windows to our home, but I'm happy with where we selected to put the ones we did add. 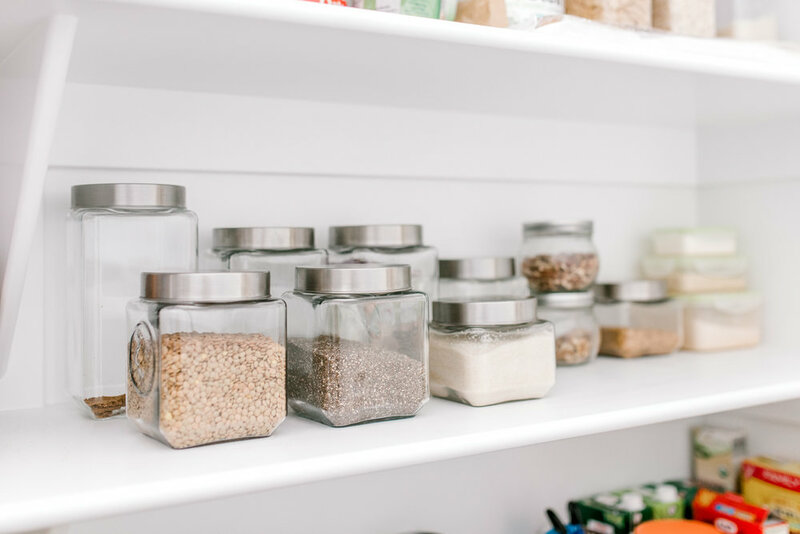 My thought for the window in the pantry was that I would be able to grow fresh herbs year round by placing them on the top shelf in front of the window. For several hours of the day, we get natural light streaming right through. We currently have a basil plant up there thriving - my favorite fresh herb! It still feels surreal. Sometimes I just stare at what we created and wonder how this happened. It's beautiful and spacious. Open and airy. I love our "Pancake Saturday's" and hosting Holiday celebrations & birthday parties. We've already made so many memories and there are so many more to be made. There you have it my Friends! Questions? I'm happy to help answer! And big big thank you to Eastbrook Homes for our gorgeous build, and for making alllllll my kitchen dreams come to fruition.